CK One Red Edition for Her is a combination of freshness and floral lust. 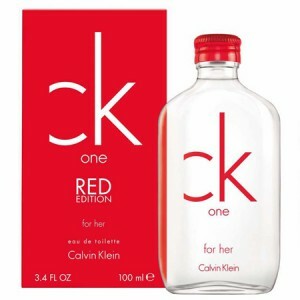 CK One Red Edition for Her 100ml. Eau De Toilette - Creating new flavors specially for Valentine's Day, Calvin Klein was guided by the mischievous, active, cheerful young people who like to party and diversity. Women's composition bold and bright. CK One Red Edition for Her is described as an attractive floral-fruity fragrance, offering a fresh new look at the composition. During the initial notes presented watermelon and violet should flower heart. The base includes patchouli, amber and white musk tender flesh. New flavors are available in bottles of 50 and 100 ml, a concentration Eau de Toilette. who is one of the most popular flavors of youth for over ten years, issued under the name of CK One Red Edition. Perfume CK One Red Edition for Her and CK One Red Edition for Him accessible from January 2014. Women's composition CK One Red Edition for Her is described as alluring floral-fruity fragrance that offers a new kind of freshness. It opens with notes of watermelon and chords violets leading to floral heart and base on the basis of patchouli, white amber and musk. It is a bright and attractive new winter 2014, which perfectly underlines the true feminine charm. Fresh summer eau de toilette is intended for young, active and cheerful girls who never stand still and always used to go to the finish. Captivating, invigorating and daring fragrance excites the senses, intoxicating freedom and energizes, highlighting the impeccable image of its owner. The fragrance is marketed as alluring fruity-floral fragrance that offers a new kind of freshness. Its originality is manifested in a combination of warm shades of violet and early watermelon, which anticipate the sound of exquisite flower "heart." Such a sweet scent palette of bright and extraordinary looks on a background of sweetish amber, aromatic, mildly resinous patchouli, gentle musk. This awakening and sensual eau de toilette, created for bold and romantic beauties, there are paired with the same masculine fragrance, such as free and independent ., as a flight of fancy.